The Viennese Ball is an annual highlight for ball-enthusiasts living in Brussels. 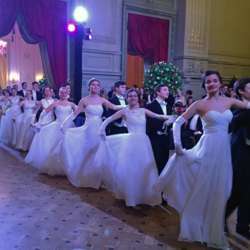 Every year during the carnival season, the Austrian Association in Belgium hosts the traditional Viennese ball. Although it is taking place far from Vienna, this ball is lacking none of the characteristic elements such as the opening of the ball by the young ladies and gentlemen of the Opening Committee, decoration in Austria’s national colours red and white as well as wine and food from Austria, and of course the famous Viennese waltzes, which are played by a live orchestra (from Vienna). Ladies - long evening dress/elegant traditional costume. Gentlemen - tuxedo/tailcoat/uniform/elegant national costume.